Analog Devices, Inc. on February 1, 2017, announced three enhanced Automotive Audio Bus (A2B) transceivers for distributing audio and control data plus clock and power over a single, unshielded twisted-pair (UTP) cable. The AD242x series of A2B transceivers offers a flexible slave-to-slave communication capability as well as support for reduced data-sampling rates. Both of these features significantly improve overall bus-bandwidth utilization and are key differentiators for emerging applications such as in-car communications and active noise cancellation. These newest devices are fully pin-compatible with existing series members, simplifying upgrade and speeding time to market. The AD242x devices include new features designed to increase system-level performance and ease of use. 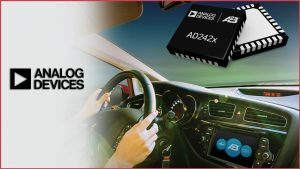 All new AD242x devices include an improved pulse density modulation (PDM) block that is critical for next-generation microphone connectivity applications. The AD242x devices also incorporate enhanced GPIO, I2C, and clocking capability to further increase system-level flexibility. Further extending the A2B technology’s reach to super-premium systems, AD242x devices can now support daisy-chain configurations for up to 11 total nodes, while increasing the maximum internode distance to 15m. The AD2421, AD2422, and AD2425 transceivers are fully compliant with all relevant automotive EMC, EMI, and ESD requirements, are fully AEC-Q100 qualified, and operate over the extended automotive temperature range (-40⁰C to +105⁰C). The new AD242x devices are available now in 32-lead LFCSP packages. Additionally, master and slave evaluation boards, as well as local- and phantom-powered evaluation boards are currently available. Please contact your local ADI representative for pricing details.